Why Do I Need a Photocopier? The modern photocopier is still the cheapest and most effective way of making paper copies of texts, documents and images. With the price of UK photocopiers being more competitive than ever, and the options to lease or buy a photocopier giving flexibility to business owners, it’s now cheaper and easier than ever to equip your office. There is a huge array of photocopiers available on the market for office use. Not only is there a wide choice of machines but there are different purchase options and maintenance considerations. Before making your purchase, you should consider some key questions, to help choose the model most suited to your requirements. What is your current paper consumption? What is your present photocopier’s meter and volume? How many copies will you make per month? Will you need colour or just black and white copies? Do you need additional functions such as faxing, emailing, scanning or image editing? A significant factor in considering your photocopier options will be cost. The cost to purchase can vary hugely, from £200 to upwards of £10,000, and depends on a number of factors like output, speed, size, capacity and numerous other specifications. It is also possible to purchase second hand machines at half the cost of new ones. The cheapest models will only handle A4 paper, whereas more expensive models can handle a variety of paper sizes. There is also a cost of owning a photocopier over its life cycle and this will incur a cost to your business. Due to the significant initial investment many companies consider leasing photocopiers. These leases can often include the option to upgrade the machine if required, giving the business more flexibility if needed. The predictable monthly expenses will give your business the ability to budget more effectively. Usually, there is no down payment required. You can get the latest photocopier for your business without making a major purchase. You have to continue paying even in the case you stop using the equipment. This is due to lease terms that include a lease period. Read our guide to photocopier rental prices, or a3 laser printer hire. Buying a photocopier involves having complete accountability for maintenance. You will need to decide if you would like to have a contract in place, since this is an expense that might not be necessary. Maintenance contracts can vary between companies and it is important to read the terms carefully. What will the contract cover? Will it be a fixed fee per month or will it be based on usage? Are the costs of parts and labour covered? Will you receive a replacement if your photocopier breaks? How quickly will a technician be sent out if required? Does your company know a technician they could call instead? Will the pricing of your contract increase over time? One of the most important decisions about a photocopier is size. You can choose a capable multi-functional device (also known as “MFD” or “MFP”) or a more compact desktop photocopier. 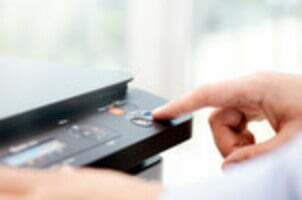 Multi-functional photocopier devices (MFDs/MFPs) are best suited to businesses or those with bulk copying requirements. Some of these machines can print over 200,000 copies per month. MFDs also have a greater variety of use, giving options for printing, copying, scanning and faxing. Finding the machine that is perfectly suited to your working environment is an important decision and with so many options available choosing the right one can seem like an impossible task. Expert Market works with the UK’s leading office supply groups, like Midshire, to ensure you get the photocopier you want at the best possible price. Xerox maintains a global status for photocopiers, with machines that are well-designed and engineered. They also offer many advanced features and options for businesses that may not come standard with other brands. To learn more, read our guide to Xerox Photocopiers. Canon is a Japanese brand that first established itself in the UK in 1976. They are known as a leader in imaging and information technology for both home and office environments. To learn more, read our guide to Canon Photocopiers. Sharp was established in Japan, and offers businesses a wide selection of copiers, from space saving models to multi-purpose and colour multifunction machines. Konica Minolta offers a range of imaging and photocopying solutions, and their Bizhub series is a very popular choice in the UK. To learn more, read our guide to: Konica Minolta Photocopiers. Ricoh copiers offer advanced technology, environmentally conscious features and extensive warranties and service agreements. To learn more, read our guide to Ricoh Photocopiers. Brother is great brand that offers a range of very affordable models. They manufacture a range of black/ white and colour models starting from just £100. By entering a few details about your requirements above you can receive a tailored quote for a variety of machines that will be perfectly equipped to meet your office’s needs.